I’m having one of those weeks where I’m ashamed to be feeling my age. My bones are achy, my muscles are sore, my joints are screaming at me to take a freaking break already. But here’s the thing — I can’t. It’s just not in my power. Most days, I scoff at those who try to remind me I’m a mere mortal (MOM!). In fact, I am constantly reminded that I’ve had these same beliefs since the time I was little. When I was but a young pup, I was obsessed with Lynda Carter as Wonder Woman, as well as the Superfriends cartoons. 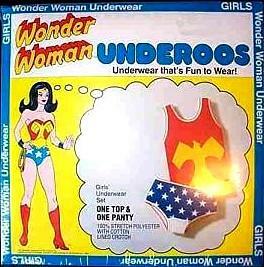 So at the ripe age of 6-ish, armed with my trusty Wonder Woman Underoos and the conviction that I was most definitely the Amazon Princess, I leapt fearlessly from one side of my family’s driveway to the other. After all, why wouldn’t I be able to fly across a two-car driveway? My heroine had proved to me that I, too, could be strong, powerful, fearless, and beautiful, which naturally meant I could will myself to fly. Dad was watching me that day, so hours later, when my mom returned home, she found me with a giant bloody gash in my forehead and no stitches to fix the damage that had been done. Quite honestly, I’m glad I never got the stitches. That scar on my forehead reminds me that I most certainly am strong and fearless. The thing that I’ve learned is that even Wonder Woman has her battle scars. It definitely doesn’t make us any less amazing.